I’m a little late posting this with these photos, but it’s still relevant and something to think about for next year. 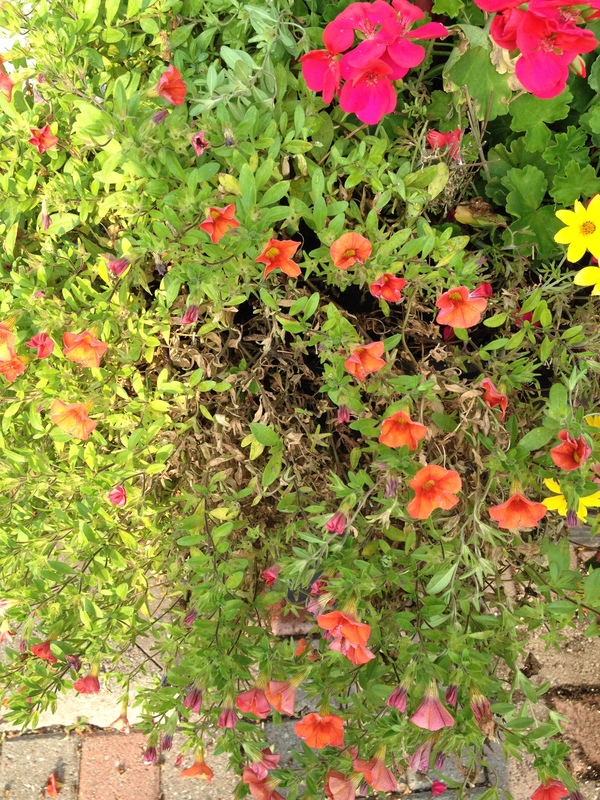 The photo above shows the beautiful Orange Million Bell (Calibrachoa), blooming for all it’s worth. Part of a huge container, along with Canna Lily Durban, Cherry Rose Geraniums and Bidens. Now I have to admit, I cheated a little with these planters. 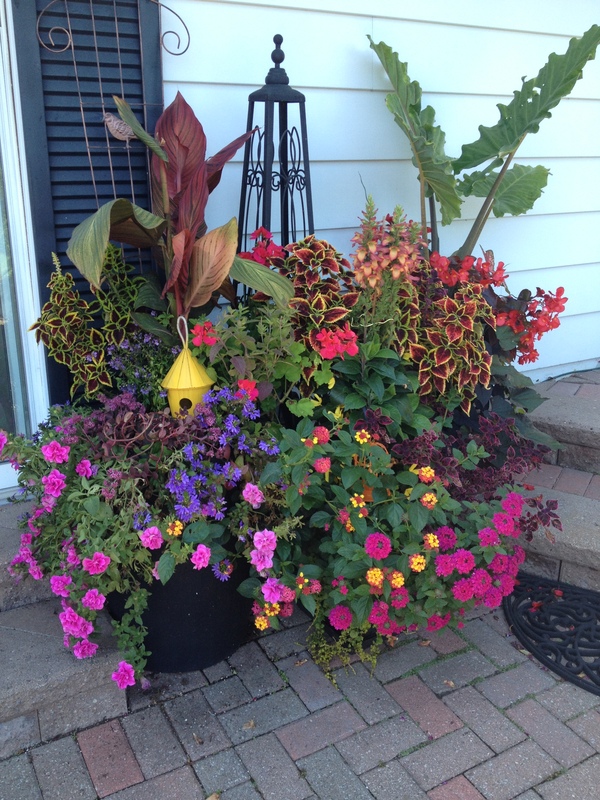 I was having people over early in the season and I usually start my planters off with small plants and let them grow into the containers, but I was a little impatient and “needed” fuller, more colourful containers, quickly. 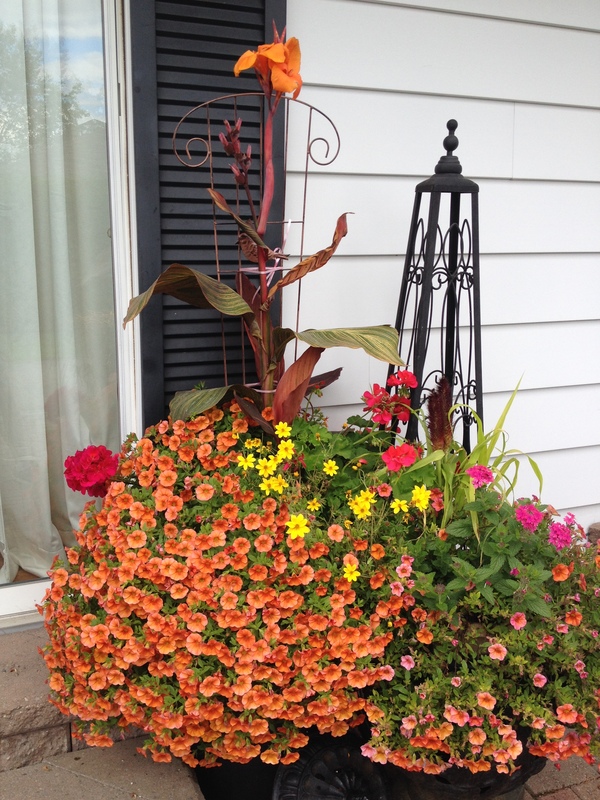 So I bought a couple of Million Bell hanging baskets, to go along with the Canna and Geraniums….fill it up a bit! Nothing soooo bad about that, but it’s just something I don’t do too often. Take your memory back to Mid/late May when the hanging basket industry is in full swing. They are EVERYWHERE!!! Even your local convenience store sells hanging baskets. To get the hanging baskets ready for the crazy crowds of customers that want instant colour and less hassle, the hanging baskets have to be almost at their peak by the time they hit the stores. The better they look, the quicker they sell. They have been growing for a couple of months in a nice warm greenhouse. Being fed heavily on flowering fertilizer so they will look super pretty for you when you’re ready to buy them. So. What happened? Well I suspect the Million Bells had been on steroids before I bought them and after a few weeks I fertilized with 15-30-15…flowering plant food. High middle number promotes bloom…just in case you didn’t know. I think the flowers were over fertilized and the plant got burnt. You might not be able to see from the photo, but the leaves were brown and crispy!!! Not what you want for your focal point!!! Now me being me couldn’t cope with a planter looking like that, so I stole a couple of plants from another planter I had on the go and here is what I have today…My colour scheme changed from Lots of Orange to lots of Pink!!! Seems to be what happened to my planters at the front. Possibly also from over watering. Good to know I am not alone. Is there a format to follow for the hanging baskets? If it’s a ready made basket. I would wait about 3 weeks before fertilizing and then use a flowering plant food fertilizer. i.e 15-30-15. Use this every 2 weeks. Make sure your baskets are well watered. It’s a good idea to water before fertilizing. Mix your fertilizer and then add that mixture to your baskets. Try not to fertilize in the blazing hot sun. Early morning is best. You mention overwatering. I think maybe this year, with cooler temperatures and more rain than usual, that may have had an effect on the way our plants have turned out this year. Some have excelled, some have been terrible. To make your baskets from scratch, here are a few tips: When you are starting your container, whatever it may be, I use a premium potting mix. For the start of the summer season, it must be new potting mix…not one that you had your Christmas Greens in or the “stuff” you used last year! Hanging baskets tend to dry out faster than planters because they are…well. Hanging! There are various methods you can use to help retain moisture. I’ve heard people using diapers in the bottom of the baskets. I’ve never done that, but I could see it helping. Another method and one that I have used is, cut a piece of plastic to fit the bottom of the basket…Garbage bag, shopping bag, grocery bag, anything plastic. Put the potting mix on top of plastic and fill to about 3/4 full. Mix in a some Hanging basket/container slow release fertilizer, that will be 14-14-14 and then add your chosen plants. Use more soil if necessary but leave about an inch from the top so the water doesn’t overflow. Water well. I use a transplant solution at this point. It has a root stimulator and gives the plants an early boost. Water every day. Unless of course we have lots of rain and your baskets get the full effect of it. Also choose plants for your sun/shade requirements.